I got back from holiday to discover three exciting parcels waiting for me. What a brilliant welcome home! Each package contained a wealth of wordy riches. The first I opened contained a review copy of The Dragonfly by Kate Dunn, which I can’t wait to start reading. The second was this year’s National Flash Fiction Day anthology, Sleep is a Beautiful Colour, containing my story Fascinate. The book offers up a selection of fabulously quirky and inventive flashes compiled and edited by Santino Prinzi and Meg Pokrass. I’m so pleased to have my tale included! The third package contained my prize for winning third place in the National Flash Fiction Day NZ competition – my favourite kinds of prizes, words. 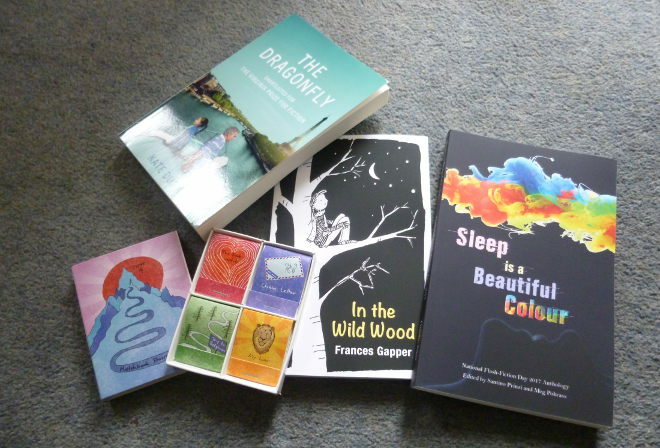 In The Wild Wood by Frances Gapper already has me enthralled, and, yes, those are teeny tiny books in the little box in the centre. So enticing!